That all sounds easy, but it is only if a company uses a digital business platform that enables an advanced, easy-to-use workflow and document / content generation and automation capability; Workflow and Content Automation (WCA) capabilities that improve the way people work digitally. This type of software needs to enable point and click workflow automation to handle everything from basic business functions to company-wide processes with a few clicks. But in addition to WCA, the digital business platform also needs to have analytics. Why? Because the business will want to monitor the workflows and determine which ones are working well and which processes still need improving. (Most of the time companies don’t look to see if a process they have implemented is effective or efficient.) For example, let’s say you wanted to see how well your expense claims process was working. In the figure below, Nintex Hawkeye is used for expense claim processing; to look claims submitted and service level agreement infringements data to sharing among the management to increase the effectiveness and efficiency of the expense claim process. Not only can a company automate a workflow digitally, but they can also monitor, capture and share the process performance for expense claims. The company can see number of claims submitted (677), the amount of expense claims submitted ($1.41M), the average expense claim amount submitted ($2.08K) and what the SLAs infringements were (1996). They can also see how the average expense claim is rising in cost each year (bar chart) and the departments who are submitting the expense reports (the circle graphic.) In this one simple example, a company can take what used to be a manual or somewhat manual process and make it completely digital as well as provide analytics around how well the process is working. Nintex’s intuitive user interface eliminates the need for complicated coding and training for the lines of business, system integrators, and IT departments as they pursue digital transformation. In addition, the workflow analytics allow companies to more effectively optimize workflows across organizations, be more productive and intelligent, correct ineffective or inefficient workflows, and thus increase revenue as well as decrease costs. To successfully compete in this increasingly digital world, enterprises need to transform their slow, error-prone operations from manual, analog processes to automated digital workflows and document generation. As companies consider their journey to a digital workplace, they will need to consider how they are going to transform all their processes that were once done on paper or in spreadsheets, to a fully digital process. A digital business platform is a great place to start. For more on this report, please click here. Atlassian acquires Trello for $425M: Will It Remain Free? As most acquisitions start out with the “ideal” that the product will remain pristine and nothing will change – it will be interesting to see if the acquisition of Trello by Atlassian will be the norm or the exception. From a business point of view Atlassian paid $425M, so they will want their investment to pay off. What’s interesting in today’s world is that instead of putting a bunch of developers in a room to develop new software, companies like Atlassian, instead buy a company. This is truly an emerging strategy in product development and one that makes sense with respect to acquiring best of breed. We hope that Atlassian will keep its word and Trello will remain free. Proof is always in the pudding. WhatsApp and Waze are both pretty good examples of high profile acquisitions. It’s generally unlikely that it will be the executive team from any start-up that ends up sticking around past whatever agreement they signed with buyer. There’s generally some “golden seatbelt” that requires the start-ups executives to stay for a particular period of time. And once that time is up, its not unpredictable that they leave that because they are “start-up” personalities – meaning they like the start-up phase and not so much the growth and maintenance or innovation phase of a company because their jobs will change and hence their interest. Second, to have a company grow, it takes people who are really good at R&D and growth strategies, which different often greatly from start-up strategies and tactics. And third, there are the maintenance executives who are really good a making a company run like a well oiled machine; again very different type of personality traits are required for this. The fourth stage is now required (it had not been as much a part of management theory in the past. But with technology changing so rapidly, innovation to stay relevant and on top requires people to look outside their comfort zone and understand what’s coming next and how can they innovate and transform their company.) Otherwise the company becomes a dinosaur and dies. We’ve seen plenty of that happening to the likes of Tower Records, Circuit City, etc..
We all have our beloved start-ups. And many of us have been part of start-ups. What’s true is that we all hope nothing will change. What is also true is that it takes a lot of effort to go beyond the start-up phase into the growth, maintenance and innovation phases. People get tired; they want their initial investment to pay off; and they truly like doing what they do best. And it may not be the other phases of what a company goes through. It’s not fair to ask people, however idealistic it is, to do things they don’t enjoy or are not good at. Will Trello stay the same? Or will it change as many other acquisitions have, as they got bought or swolled up, and give into the reality of the phases of what it takes for an initial idea to grow into a company? Only time will tell. 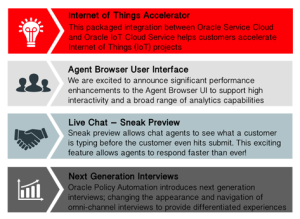 Oracle Service Cloud announces new releases for enhanced functionality in Web Customer Service, Contact Center including the Agent Browser User Interface, Knowledge Advanced, Policy Automation, and the Oracle Service Cloud Platform. Included in he release is a new Internet of Things (IoT) Accelerator, which provides a bi-directional integration with Oracle IoT Cloud. The integration helps customers seamlessly interface with IoT technology so that service events and alerts received from smart devices can be consumed, as well as appropriate action taken by agents, within the Oracle Service Cloud desktop. Field Service seems to be an area where IoT can easily provide true use cases that can quickly garner ROI. It will be interesting to see how vendors incorporate IoT in the customer experience. The Internet of Things (IoT) accelerator will allow internet enabled devices connectivity to Oracle Service Cloud. Accelerators are a collection of sample code, sample workflows, and best practices, documentation, and design guidance to assist customers with seamless updates or integrations with Oracle Service Cloud. Oracle Service Cloud also provided a sneak preview of Live Chat. What is the capability really about? Sneak preview allows chat agents to see what a customer is typing before they hit submit. Sneak Preview is designed to enhance agent productivity and bring value to the contact center by decreasing handle times. By allowing the agent to see what the customer is typing ahead of time they can begin to formulate an answer faster, which results in faster responses, and faster conversations. And Live Chat is now a fully supported channel; contacts are automatically matched and the contact and chat workspaces are integrated. In addition, the release includes analytics performance enhancements with caching for frequent reporting and better notifications for report authors. Modern gauges are added to create much more intuitive and modern reports, allowing users to interpret data quicker, as well as new rendering options, to remove unnecessary components in reports, crisper rendering of charts, and a new modern layout theme. 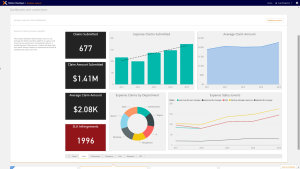 In addition, there is a new dashboard concept—specifically designed for that 5-second-glance overview for busy customer service leaders. These at-a-glance infolets are available out-of-the-box and contain a number of single metric charts with real-time key performance indicators like open incidents by severity, SLA, First Contact Resolution, new incidents by channel, and so forth. Contact Center Directors can also schedule and send the infolet dashboard by email to key stakeholders at regular intervals. This is key as the more senior stakeholders are more involved, the more they begin to realize the importance of customer experience and customer service to the overall health, stability and revenue generation capabilities of their company. In addition, the the agent browser UI has gone through a significant performance enhancement to support high interactivity and now supports a much broader range of analytics capabilities. The agent browser user interface is now a single version, meaning it is compatible with versions of Oracle Service Cloud all the way back to May 2015 and upgrades will now happen with zero downtime. The UI theme has been updated for consistency across all Oracle Cloud portfolio applications. Knowledge authors can now use the Agent Browser User Interface to author and edit knowledge articles with a new HTML editor with HTML5 support. As the race to provide the best customer experience continues, brands must choose between more single point solutions vs large system platforms. It will be interesting to see the choices of brands and how the customer experience evolves to meet the brand promise. Genesys has completed the acquisition of Interactive Intelligence. Why acquire Interactive Intelligence? 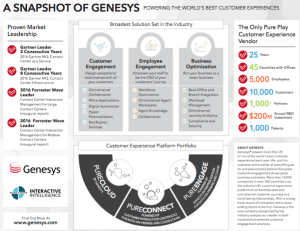 The idea is that the addition of Interactive Intelligence will enable Genesys to accelerate its mission of powering the best customer experiences in more industries and more countries – over any channel in the cloud and on premises. The acquisition also means that Genesys now has over 10,000 customers in more than 100 countries supporting over 25 billion customer interactions per year. Genesys will continue to offer support and invest in best-in-class solutions, including PureCloud®, Communications as a Service℠ (CaaS) and Customer Interaction Center™ (CIC), in addition to our core Genesys products. In terms of how the company is run, Paul Segre will continue to serve as CEO, providing leadership that best supports the needs of customers, partners and employees. Genesys will maintain its headquarters in Daly City, as well as key offices in Indianapolis, Indiana and Durham, North Carolina. This acquisition is one of many that are being seen in the customer service and customer experience world. It gives Genesys a larger customer base and integrates many of the features and functions Interactive Intelligence brought to the table. As customer experience becomes one of the most important differentiators in a brand’s overall experience, choosing the right vendor to deliver on complex customer service and customer experience interactions will be key. While there are vendors that are part of a larger marketing, sales and service suite, there are other vendors who remain focused on the customer service marketplace. Time will tell how organizations see the need to go with solutions that service part of an organization vs having the capability to connect to the back office as well as other lines of business. Jacada Ltd. (OTCQB: JCDAF), a global provider of customer experience technology designed to simplify the interaction between businesses and their customers, announces that Israel Growth Partners (IGP), a Private Equity investment. Jacada’s visual IVR is a key asset to their capabilities has other digital transformation solutions aiming to reduce the cost to serve customers while driving a seamless customer journey. The visual IVR transforms the typical “press 1 for….” Press 2 for…” type of IVR and instead uses a touch interface. Companies looking toward digital transformation of the customer experience are using the visual IVR as a cornerstone of their digital transformation. This investment should be helpful in Jacada’s future growth. Searches for Influencer Marketing have grown 5x in 2015 according to a study from Google Trends from January 2016. Nearly 40% of Millennials are using ad block applications and their use is growing fast according to a study by PageFair & Adobe. So how does a company get their target customer’s attention? And with content marketing a #1 priority for most CMOs as more and more sales are decided upon before even talking to a sales person. And sometimes a salesperson is never contacted, so getting the customer’s undivided attention has never been so important. Perhaps the answer is video marketing. Video consumption has exploded across all devices and is one of the fastest growing advertising category. Adobe, a the leader in video content creation and delivery, announced it’s acquisition of TubeMogul which will enable brands to capitalize on the huge shift to online video. The acquisition of TubeMogul strengthens Adobe’s leadership in digital marketing and advertising technology. The addition of TubeMogul will enable Adobe’s customers to maximize their video advertising investments across desktop, mobile, streaming devices and TV. TubeMogul’s video advertising platform. In addition, this allows their customers to build upon their capabilities in search, display and social advertising planning and delivery using Adobe Media Optimizer with Adobe Marketing Cloud. This combination will give customers access to first-party data and measurement capabilities from Adobe Audience Manager (Adobe’s data management platform) and by using Adobe Analytics. Why is video advertising so important? Brad Rencher, executive vice president and general manager, digital marketing, Adobe gave this statement, “Whether it’s episodic TV, indie films or Hollywood blockbusters, video consumption is exploding across every device and brands are following those eyeballs.” Adobe feels the acquisition of TubeMogul, will give customers a ‘one-stop shop’ for video advertising, providing even more strategic value for the use of the Adobe Marketing Cloud. TubeMogul is a video demand-side platform (DSP) leader. Brett Wilson, CEO and co-founder, TubeMogul said, “The combination of Adobe Marketing Cloud with TubeMogul’s software creates a uniquely comprehensive platform that will help marketers always know what’s working — and act on it.” And what’s key is measurement – to know what is working and not working, and obviously do more of what is getting a result. There are so many choices for Marketers today, as far as software and it is only getting more confusing with all the choices. When a software company can show you how to get results, you know you are going in the right direction. Education and learning to use all the features and functions of what the various software platforms provide is of growing concern for most companies to obtain the highest ROI possible for the investment they have made. It’s key that Marketers are clear on what their strategy, goals, objectives and tactics are and have a strong measurement program to be able to show that the software purchase enhanced the brands ability to drive more awareness, increase customer acquisition and turn more leads into sales. And with ad blocking increasing, there’s got to be another way to get customer’s attention. Video seems to be a prime candidate. This is just one example of how early adopters and innovators are taking hold of the market place and making their competition irrelevant. And like the BlueOcean authors said, that’s the key to financial success in today’s marketplace. 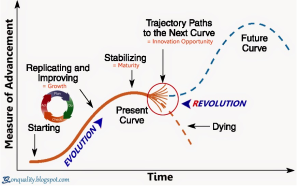 Cross the chasm, join the digital transformation and digital disruption evolution or expect to be disrupted. Disrupt or be disrupted. Those are the choices to being innovative leaders and using design thinking to transform your business revenue model. Constellation Research is launching a new program, and I’m happy to share the Constellation ShortList™ for Social / Digital Media Listening / Monitoring/ Engagement Platforms. The program offers buyers of technology a list of offerings to consider in their pursuit of digital transformation. Social, digital media listening, monitoring and engagement platforms are designed to build better brand engagement to drive customer loyalty and advocacy. The Constellation ShortList presents vendors in different categories of the market relevant to early adopters. In addition, products included in this document meet the threshold criteria for this category as determined by Constellation Research. This Constellation ShortList of vendors for a market category is compiled through conversations with early adopter clients, independent analysis, and briefings with vendors and partners. Social / digital monitoring / listening and engagement solutions include listening, monitoring, analytics and intelligence, and engagement capabilities. Social listening platforms capture online conversations based on the specific search query, offering key insights through the analysis of those conversations. These solutions are designed to evaluate a company’s activities and inform them on an overall social/digital media strategy. Often data from online can highlight every part of the business – from product launch and development to manufacturing and delivery. Companies can develop social/digital strategies based on the insights gained through social/digital media monitoring. When a brand focuses on the highest potential markets or groups identified through market segmentation and influencer analysis, they can identify the optimal conditions for brand engagement and advocacy. Process management and user interface, data dashboard, workflow management, engagement capabilities, publishing, CRM. Constellation evaluates over 50 solutions categorized in this market. This Constellation ShortList is determined by client inquiries, partner conversations, customer references, vendor selection projects, market share and internal research. For more information, please see the Constellation Research website. Congratulations to the Constellation Super Nova Award Winners in Customer Experience! The reason we at Constellation Research created the SuperNova Awards is because we know advancing the adoption of disruptive technology is not easy. Technology adoption faces resistance from budget constraints, hurdles to adoption, and myopia. All the finalists here today have successfully implemented technologies that will lead their organizations into the future. These people have vision. These people are leaders. These people understand the value of disruptive technology. All of the SuperNova Award applications are on the Constellation website. Scott Strickland and Jim Flatt from Denon + Marantz Electronics. Make sure to apply next year! Congratulations to all the executives and their teams who are truly making a difference in creating great customer experiences. @DrNatalie, VP and Principal Analyst, Constellation Research, Covering customer-facing applications that deliver excellent customer service and customer experience!